My youngest son is drawn to non-fiction books. While I applaud his love of reading, some non-fiction books focus more on facts versus a story. Over time he has learned many facts (almost a walking encyclopedia - yes I'm exaggerating). But, his understanding of who and why a story unfolds with characters and plot is lacking. 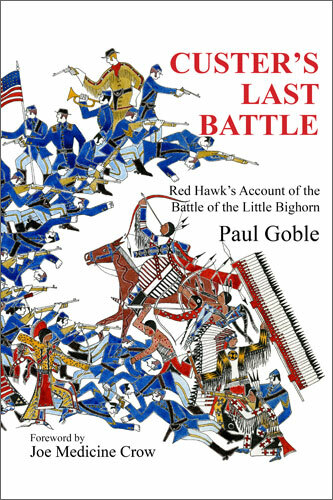 Custer's Last Battle is a great compromise for the non-fiction enthusiast and the story lover. This story is told by an young warrior, Oglala. At just 15 years old, this young warrior bravely joins other Native Americans into battle against General Custer. Although the General was warned that victory was unlikely, he thought that his "luck" would keep him and his troops safe. But, the strong, determined Native American warriors fought to preserve their land and heritage. In the end, General Custer and his troops retreated. Personally, I was intrigued by the vibrant illustrations that accompanied the story. These illustrations brought a visual perspective to the moving words shared by Oglala. Readers see that the story of Custer's Last Battle is not just a simple war tale. This fictional story brings to life the heart, determination and bravery of all those who were willing to fight. For our family, this storybook is a great addition to our library. Also, this book would be a great gift to a school or classroom library. Our school requests that kids bring books to the classroom for birthday donations in lieu of classroom trinkets. Custer's Last Battle by Paul Goble is is par the Wisdom Tales line. These books were created for the purpose of sharing the wisdom, beauty, and values of traditional cultures and peoples from around the world with young readers and their families. The content, illustrations, and production quality of these books is intended to assure them a lasting value for children, parents, teachers, and librarians. Here's a little more about the author. Paul Goble is an award-winning author and illustrator of over 40 children’s books. His book, The Girl Who Loved Wild Horses, won the prestigious Caldecott Medal. His most recent books are the award-winning “stories from the tipi” series, which includes The Man Who Dreamed of Elk-Dogs, The Boy and His Mud Horses, and The Woman Who Lived with Wolves. For more information on this book or other Wisdom Tales, please visit the Wisdom Tales website and Facebook page.